Utterly stunning movie, a must have for Horror lovers. "You have to hand it to the walking dead. What they lack in speed and agility, they more than make up for in sheer single-minded determination. Im-Ho-Tep is a case in point. He's an ancient Egyptian priest, cursed for his terrible crimes against the gods. A team of British archaeologists digs up his sarcophagus, along with a box inscribed with a warning that opening it will unleash death and destruction. You'll never guess what they do. Once freed, Im-Ho-Tep takes on the appropriately evil alias Ardath Bey and gets to the task of resurrecting his ancient lover--which will, of course, require a living human surrogate. While the premise may sound formulaic, The Mummy in fact turns out to be bracingly weird, relying on atmospheric creepiness rather than on jump-out-and-scare-you effects. 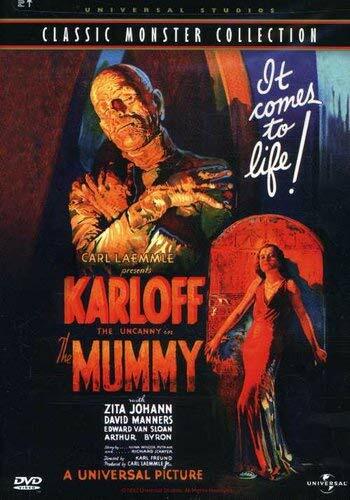 Boris Karloff gives a terrific performance as Im-Ho-Tep. He has all the malevolence the film requires, but also manages subtler touches; the expression in his eyes as he is wrapped in preparation for being buried alive is absolutely chilling. Instead of forcing him to do all the tedious shambling around that so many mummies resort to, the filmmakers have wisely given Im-Ho-Tep/Ardath Bey a nearly living appearance once he's cleaned up and has a few psychic powers to boot, making him a potent adversary. Stock up on ace bandages and prepare for a good spooky evening."